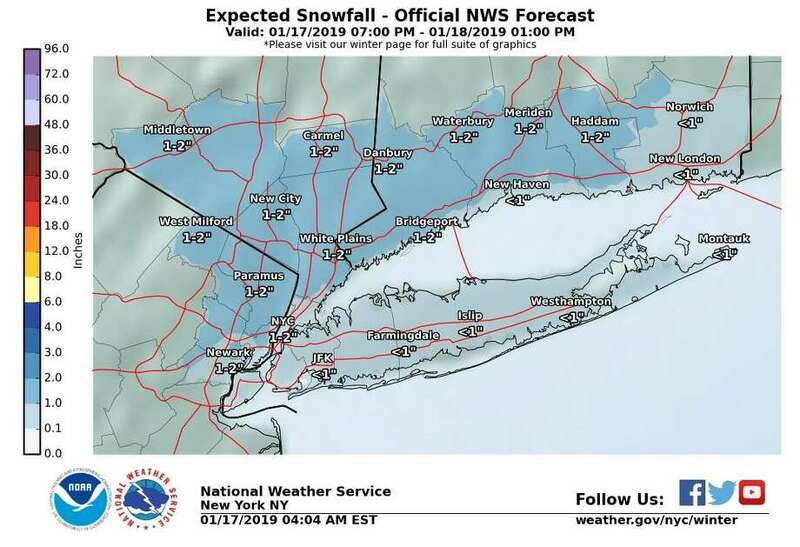 The National Weather Service has posted a winter storm watch for the northern half of Connecticut with several inches of snow Saturday night into Sunday. “It is possible some locations could have double-digit snowfall by Sunday, which is another reason why we issued the watch,” the NWS says. The watch is in effect from 4 p.m. Saturday to 7 p.m. Sunday. This snow will arctic high pressure bringing us our coldest temperatures of the winter Monday into Tuesday. Monday night will be bone chilling with lows just a few degrees above zero. Areas father north in New York state, Massachusetts, Vermont and New Hampshire could get more than two feet of snow. Father south, warmer air will mix in to create a wintry mix of snow, sleet, freezing rain and plain rain, especially for southern Connecticut. The first storm, to come late Thursday to Friday morning, is nothing compared to what Saturday is set to bring. Dangerous blizzard conditions with a foot or more of snow is forecast to fall from northern Pennsylvania to upstate New York and northern New England this weekend. “Those who are on the road through the heart of the snow area will be at risk for becoming stranded for many hours and may have to face temperatures plummeting to life-threatening low levels,” AccuWeather said. As the storm strengthens, winds are expected to cause major blowing and drifting snow where ice does not mix in. A possibility of 40 inches is projected in parts of northern New England, with close to 30 inches expected to fall on parts of central and northern New York state. There is the possibility of strong winds bringing down tree limbs enough to cause power outages. Expect a light snowfall to begin from southwest to northeast after midnight. Still expecting mainly light snowfall rates of around half an inch per hour or less, resulting in a general half an inch to 2 inches by the time all is said and done. Most of Connecticut is in the 1- to 2-inch range with the immediate shoreline and southeast Connecticut getting the lowest accumulation. The best chance of show is between 1 and 4 a.m. Snow is also likely during the morning commute Friday. All snow should be over by noon. Saturday will start as partly sunny with a high near 29. There is a 40 percent chance of snow, mainly after 3 p.m. The best chance of snow is between 6 p.m. Saturday to 8 a.m. Sunday. After that, sleet is likely for most of the day for areas away from the shoreline. Projected snowfall is between 3 to 7 inches for areas at least 20 miles from the shoreline. The immediate shoreline could get between 2 to 4 inches. Farther inland, Torrington and Litchfield are in 11-12-inch range. The Berkshires of western Massachusetts could get between 18-21 inches. Vermont is looking to get up to two feet. Because forecasts vary, click here to find your local forecast. Just enter your town name, state or zip code in the box in the upper left of the NWS home page. The big concern isn’t the snow, but icing. On Sunday, warmer air is expected to change the snow to freezing rain and sleet before 10 a.m., then rain and sleet between 10 a.m and 1 p.m., then freezing rain and sleet after 1 p.m. High near 34. Chance of precipitation is 90 percent. Areas farther inland the transition from snow to sleet and freezing rain will be slowed. The NWS says the freezing rain could lead to some power outages Sunday. Freezing rain could make travel difficult or nearly impossible at times. Temperatures rise into the upper 30s and low 40s in southern and southeast Connecticut Sunday morning. But temperatures will rapidly drop back below freezing in the afternoon and evening. Any standing water could quickly freeze, creating hazardous travel conditions even where little wintry precipitation occurs. Temperatures will continue to plummet through the overnight Sunday,with lows Monday morning ranging from the single digits to near 10 degrees. Gusty northwest winds will result in wind chills around 5 to 15 degrees below zero. The lowest wind chills are most likely to occur across the interior. The arctic air remains in place on Monday as high pressure builds into the region. Highs will only be in the teens with wind chills staying 0 to 10 below. Temperatures should warm into to the 20s and low 30s on Tuesday and then potentially above normal on Wednesday ahead of the next system approaching the area. More snow is possible Wednesday night. Monday is Martin Luther King Day. That means no school and for mostly government employees, no work.